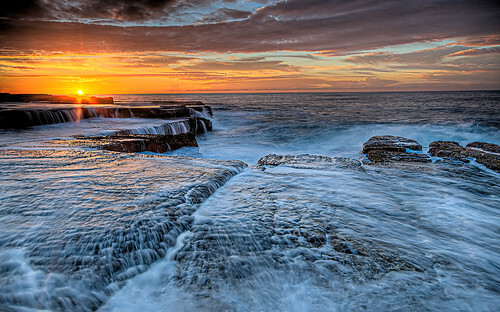 There are two things you can capture at Mahon Pool. The pool itself or the fantastic rock stairs just to the North of it. This huge pool offers great reflections and is framed by the fence that goes around the outer side of the pool. Some people may find the rail, that leads down to the pool a bit of an eyesore, but it is an easy clone fix in Photoshop, if you wish. A classic composition is to shoot it from high above, close to the car park, to take in the whole of the pool as well as the surrounding cliff faces and the ocean. Alternatively, as you can see in the above shot a low shot from the south-east corner of the pool offers great sunrise reflections on the water. Depending on the tide, you can get lovely waterfall shots from those stairs to the north. You need to be careful, because the water easily runs over the relatively low rocks where you will probably take position and a mid-range lens may be suitable for this job in order for you to return home with dry socks. Otherwise I highly suggest to take advantage of one distinct rock that peeks out just behind the pool at it’s north-east corner (visible in the 2nd shot). Just the usual stuff, a towel and/or lens cloths are a good idea. There are bath rooms next to the pool just a few steps away from the car park as well as a shower, where you can rinse off your gear. Sunrise or a particularly gloomy day. Stormy conditions with waves crushing into the pool would be a great option too. Do not shoot this area at low tide, as the water will hardly go over any of the lovely rocks. I would say mid-high tide would be perfect. If you go at high tide, make sure you are in an elevated spot, as the water comes all the way up to the pool. You are sheltered from the Northerlies, but very exposed to Easterlies, so bring a few dry lens cloths if it’s windy. Great guide, will have to give it a try early one morning. 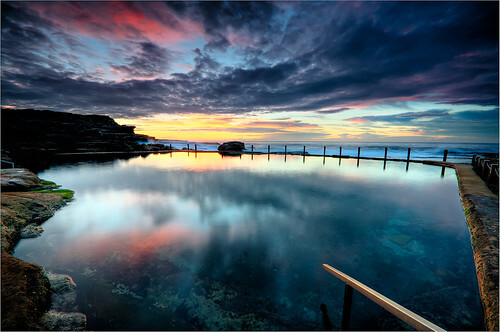 Great pool — One morning last November I headed out to Mahon Pool one Sunday morning. It was still dark, and I was composing a shot, when I saw people in the distance and heard voices. These people were dressed, so they didn’t seem to be swimmers; I figured the were fishermen. They approached, and I saw the familiar sight of tripod legs. It was none other than Brent and Kajo. What a great surprise, especially as I’d tried to ring Brent the night before to organise a shoot for that morning. It turned out to be a great shoot which landed me some pleasing images. 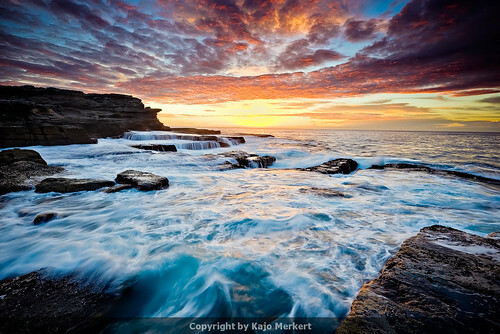 This pool is fantastic, and Kajo’s images are also top-notch. As a dedicated seascaper, this one’s highly ranked as a pool worth shooting.